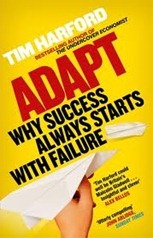 This is a review of “Adapt: Why Success Always Starts With Failure” by Tim Harford which puts forward the thesis that “trial and error” is the only way forward for complex endeavours to succeed. Making sure that you have systems in place to cope with failure. Each of these tasks is illustrated with a wide range of real-life examples: using the Iraq War to highlight the difficulties of running “trial and error” inside control structures that are designed to take in information, channel it to the top of the organisation and provide a channel back from the top to the bottom. Donald Rumsfeld, apparently, would not refer to the “insurgents” as “insurgents” so hobbling the US’s ability to fight an “insurgency”. Alongside these major case studies are smaller ones, such as on Jamie Oliver’s school dinners which showed that feeding children healthy food at primary level led to measurably better outcomes in education and attendance than comparable groups not within the scheme, you can see the study here. There is also a section on using a carbon tax to address anthropogenic climate change, this fits in as a way of making selection possible by providing a simple measure of “success”. Harford is scathing of the ”Merton Rule” which demands that new build of above a certain size generate 10% of their electricity onsite by renewable means. As put by Harford this means installing capacity rather than demonstrating capacity which has lead to the use of dual fuel systems (nominally able to take renewable fuel) that are ultimately only used with non-renewables so providing no benefit at all. The Piper Alpha and Three Mile Island accidents are provided as examples of the importance of being able to fail safely, they didn’t or rather Piper Alpha didn’t – arguably Three Mile Island just about failed safely. This was linked to failings in the financial system where large organisations, such as Lehman Brothers failed in a matter of hours with administrators scrabbling around frantically to come up with a controlled-landing plan. This is failure at large scale, but there is also coping with failure at the personal scale. For example, using “Deal or No Deal” as a model system in which contestants can “lose” which changes their estimations of risk for subsequent play for the worse. One issue with “trial and error” is that the proponents of any method are often so convinced of the value of their method that they feel it immoral to subject anyone to an “inferior” alternative in order to conduct a trial. This is highlighted with a story about Archie Cochrane, pioneer of the randomised control trial in medical studies. He had been running a study on coronary care, comparing home-based care to hospital care. This had met with some opposition, with medics insisting that the home-based arm of the trial was unethical because it was bound to be inferior. When results started to come in it turned out that one branch of the trial was inferior to the other – Cochrane misled his colleagues into believing it was the home-based arm that was inferior – they demanded that it should be closed down but were rather silent when he revealed that it was in fact the hospital-based arm of the trial that was inferior! Harford also discusses funding for research, in particular that blue-skies research could not be valued because the outcomes were so uncertain, highlighting the success of the Howard Hughes Medical Institute which funds speculative biomedical research in the US. What he goes on to say is that the use of prizes is a way out of this impasse. Using as an example the Longitude Prizes, his presentation plays up the friction between Harrison and the Board of Longitude. The Academie Des Sciences also ran prizes but until recently the method had been out of favour for approaching 200 years. The recent revival has included things like the DARPA challenges for self-driving cars, Ansari X Prize, the Bill and Melinda Gates Foundation prize for vaccines and Netflix’s film selection challenge. These have been successful, however it’s difficult to see them finding more general favour in the academic community since the funding is uncertain and appears only after researchers have expended resources rather than receiving the resource before doing the work. From a practical point of view “trial and error” happens in the private sector, if not within companies then between. In the voluntary sector it has taken some hold, for me some of the more compelling examples were by the “randomistas” studying the effectiveness of aid programmes. In the public sector “trial and error” is more difficult: there is less scope for feedback on the success of a trial – you can’t meaningfully count customers through the door, or profits made, so there is a need for proxy measures. Furthermore, the appearance of failure carries a high price in the political sphere. This is not to say it shouldn’t happen, simply that “trial and error” face particular challenges in this area. I like the central thesis of the book, it fits with my training as a scientist; my field allows for more direct experimentation than a randomised trial but the principle is the same. It also has pleasing parallels with biological evolution, which Harford explicitly draws. The book is well referenced, in fact I hit the end unexpectedly as I was reading on a Kindle – I couldn’t “see” the length of the end notes! It’s very popular these days to blame the “bankers” for the recession, and indeed “bash the bankers”. No doubt some of this enthusiasm is down to the fact that “bankers” sounds a bit like “wankers”, and many gain a simple pleasure from this recognition. Finance (or banking) meant that I could afford to buy a house costing £50,000 with a salary of only £25,000 (this was some time ago! ), and investment means that companies wishing to grow can do so without having to painstakingly build up cash reserves by trading. Dealing in these investments is what will help pay for my retirement through my pensions – this is true for both my Universities Superannuation Scheme and my company pension. Insurance helps us to cope with financial shocks we could not otherwise bear, the premiums for this insurance are often invested so reducing the amount of the premiums. Banking is a mild confidence trick, it generates extra cash on the basis of anticipated future income. The crash happened because banks lent to people who, it turns out, couldn’t realistically be expected to provide that future income. On realising this the banks found they had promised the provision of rather more money than they had access to and flapped around trying to call that money in. More specifically, in the US, banks were giving mortgages to people who didn’t have jobs but who could “afford” a mortgage because “of course” the value of the properties was always going to increase and so the interest on the mortgage would be covered by the rising house value. This scheme worked because these dodgy mortgages were bundled up together and then traded. The bundling reduces the risk, as long as there is no systematic shock that effects all of the mortgages in the bundle. The bank bailout was not a cash gift in the sense that you might give me £50 for my birthday, it was money to give the banks confidence to keep lending out money which many of us need to live in the manner to which we have become accustomed. In a way the current lending targets for banks are perverse: we’re in the position we are in now because the banks lent more generously than was wise – now we’re encouraging them to lend more than they would otherwise wish. The bank hardest hit by the crash in the UK was Northern Rock, not a bank engaging in particularly aggressive or exotic trading, rather one that gave the opportunity of owning a house to rather more people than it was strictly wise to do so. In retrospect you could see the seeds of this over-lending 10 years ago, when I was offered a mortgage 4x joint salary, or when you saw all those programs featuring people in their twenties who had £20,000 and above on credit card bills built up on purchases they didn’t need and couldn’t afford. This isn’t to say the financial sector is without faults: they have a habit of selling products to people who don’t need them (like that mortgage protection plan you sold me Cheltenham and Gloucester), they invent financial abstractions which no-one has a hope in hell of understanding and, because they preside over large money flows, they are able to pay themselves very nicely by extracting a small charge from those vast flows whilst many people are not doing so well. For me this is personal: my brother has worked in the IT departments of several investment banks, currently the town where I live is facing the possibility of 3,500 job loses because the Bank of America may be closing its credit card handling centre. I don’t want the 3,500 or the one to lose their jobs. It’s easy for politicians to piggy-back on this enthusiasm for banker bashing but we should be aware that many of the things we take for granted are built with the support of the financial industry. This blog post is my review and notes on “The Ascent of Money: A Financial History of the World” by Niall Ferguson. It’s a thematic run through the key elements of our current global finance system which ends with subprime mortgages and the present day. Money, tokens representing value, started with the clay tablets of Mesopotamia as “promissory notes” for goods some 4000 years ago. For a very long time the basis of all money was precious metals such as gold and silver, it’s only been in the last 40 years or so that the link to gold has been broken for major currencies. The Spanish were burnt by metal coin when they started extensive mining for silver in South America – devaluing the coin in Europe through excess supply. Fibonacci helped to introduce Hindu-Arabic numerals to Europe in 1202 through his book, Liber Abaci, which contained commercial calculations including currency and interest rates. Many of the early bankers were Jewish, they were legally restricted from taking part in many sorts of commerce and, through usury laws, the Christians were unable to lend but Jews could (their usury laws restricting lending to other Jews). Banking really took off with the Medici family during the 15th century, originally they dealt in foreign currency but diversified and, critically, became big. Size was important, because large size reduces risk. Banking innovation then moved north from Italy with three innovations: the Amsterdam Exchange Bank (1609) introduced a standard currency, the Stockholm Banco (1657) started lending and then the Bank of England (1694) started issuing notes which meant there was no need for an account with the bank. This is followed by the issuing of government bonds, these are essentially the way governments raise debt. Bonds have a face value – and an annual percentage return on their face value but the price at which they are sold in the market may vary. They were initially used by governments to raise money for wars. Rothschild bank made it’s money in this way in the early 19th century. Bonds are seen as very secure investments, but governments do default – most recently the Russia government in 1998. The final innovation was the limited-liability company, a way by which individuals could band together to undertake longer term projects without risking everything (they only risked the value of their shares). The first of these was the Dutch East India Company founded in 1602 – formed to conduct the spice trade with the Far East (a risky and expensive business). In theory the directors and shareholders hold the company to account but in practice the value of the company shares on the stock market is the real control. The first great stock market bubble was the Mississippi Company in France and was led by a Scotsman, John Law. Along with with control of the company he also exerted considerable control over the Banque Royale – the French national bank. The result was a system of share sales which spiralled completely out of control with the central bank making almost daily changes in its rules to enable the sale of more shares in the Mississippi company or to support their price. Ultimately the whole system crashed in 1720; Ferguson argues that this led in part to the French Revolution since the whole performance put the French off exciting financial innovations which could have lead to a more stable system. Displacement – something changes which leads to a new economic opportunity. Euphoria – prices start to spiral upwards. Mania – first time buyers rush in and fall prey to swindlers. Distress – insiders realise the game is up and start to leave. Revulsion – everyone else realises the game is up and try too leave too. The bubble bursts. The depressing thing is that people have been dutifully following these five steps for nearly 300 years! Next up is insurance, and scientific developments in statistics make an appearance. Ferguson focuses on the Scottish Widows insurance scheme, set up in 1744, to pay pensions to the widows of Scottish clergymen. Although he introduces a wide range of statistical developments including work by Pascal, Bernoulli’s (Jacob and Daniel), de Moivre and Bayes it seems to me the key development were the mortality tables compiled by John Graunt in 1662. The presence of numerate scientists should not be seen as a panacea though, the Black-Scholes equation for pricing options looks like a piece of thermodynamics: Merton and Scholes won a Nobel Prize for it (Black missed out having died) nevertheless over-enthusiastic application of this equation lead to a fairly serious crash. Ferguson comments that we are currently in a second round of globalisation, prior to the First World War financial markets were already fairly globalised although quite often under circumstances of colonisation. The outbreak of war necessitated a substantial increase in government support and intervention in the markets and after the war difficult economic circumstances made it easy to continue with this. It’s interesting to note that the idea of the property owning democracy grew out of the New Deal in the US in the 1930’s prior to that time only 40% of householders in the US were homeowners – the figure now approaches 70%. The same has happened in the UK, although somewhat later with fewer than half of people homeowners in 1970 and a level of approximately 70% now. In a sense the subprime mortgage lending that led to the recent recession is the final playing out of this policy. Ferguson is clearly not too enamoured of the property-owning democracy – seeing it as an over-concentration on a single asset class. I found this a nice background to understanding economics, it shows how various financial innovations were introduced and how they can contribute to a successful economy. It also highlights how the misuse of such innovations can lead to financial disaster, and does so with depressing frequency. The chronology through the book is not very clear, I suspect he expands on particular instances that best illustrate his point rather focusing on first introduction. Although it has extensive notes and indexes, it could do with a glossary. This blog post seeks to answer the question: what economic growth rate does the UK need to sustain in order to reduce the deficit to zero? This seems like a relevant question at the moment, and I’ve not seen a straightforward calculation of the answer – so I thought I’d give it a go myself. The idea being that even if the end result is not particularly informative the thinking behind getting the end result is useful. The key parameter of interest here is the gross domestic product (GDP): the amount of goods and services produced in a year in the UK; it’s a measure of how wealthy we are as a nation, how it increases with time is a measure of economic growth. Also important are the deficit (how much the government’s annual spending exceeds its income) and debt (how much the government is borrowing). Inflation means that the GDP can appear to grow each year with no increase in real economic activity, therefore I decided to use “inflation adjusted” GDP figures. I also preferred to use annual GDP figures rather than quarterly ones. To model this I took a starting point of a known GDP, debt, deficit and government spend which I then propagated forwards in time: I made the GDP grow by a fixed percentage each year, and assumed that government spending would be flat (I’m using GDP adjusted for inflation so I think this is reasonable). Assuming that the total tax take is a fixed proportion of GDP I can calculate the deficit and hence increasing debt in each year, I add the debt servicing cost to the government spending in each. Since I’m doing everything else in the absence of inflation I’ve used a debt servicing rate of 2% rather than the 5% implied by a £43bn debt interest cost in 2010 – this makes my numbers a bit inconsistent. I’ve put the calculation in a spreadsheet here. Given this model my estimate is that the UK would need to sustain GDP growth of 4.8% per year until 2020 in order to reduce the deficit to 0%. This 4.8% GDP growth brings in approximately an additional £30bn in taxes for each year for which the growth is 4.8%. During this time the debt would rise to nearly 80% of GDP and so the cost of servicing the debt will double. These numbers seem plausible and fit with other numbers I’ve heard knocking around. The red line shows the “target” 4.8% GDP growth, and the blue bars the actual growth in the economic, adjusted for inflation. The data comes from here. What’s notable is that GDP growth has rarely hit our target and what’s worse, over the last 40 years there have been four recessions (where GDP growth is negative), so the likelihood must be that another recession before or around 2020 is to be expected. In real-life we are actually using a combination of GDP, government spending cuts and tax increases to bring down the deficit. These calculations indicate 0.5% GDP growth is approximately £7bn per year which is equivalent to a couple of pence on basic rate (see here) or about 1% of government spending (see here). Doing this calculation is revealing because it highlights why there is an emphasis on cuts in government spending as a means of reducing the deficit. This had been a bit of a mystery to me with the figure of 80:20 cuts to taxes ratio being widely quoted as some sort of optimum, although there is some indication of other countries working with a ratio closer to 50:50. The thing is that when you cut your spending, you are in control. You can set a target for reduction and have a fair degree of confidence you can hit that target and show you have hit that target relatively quickly and easily. On the contrary relying on growth in GDP, or taxes, is a rather more unpredictable exercise: taxes because the amount of tax raised depends on the GDP. The Office for Budget Responsibility (OBR) published uncertainty bounds for it’s future predictions of GDP in their pre-budget report last year (see p10 and Annex A in this report), their central forecast is for growth of 2.5% but by 2014 (i.e. in only 4 years) they estimated only a 30% chance that it lay between 1.5% and 3.5% actually they only claim a 40% chance of being in that range for this year (2011). At the risk of being nearly topical, GDP is reported to have shrunk by 0.5% in the last quarter of last year, 2010. This is largely irrelevant to this post, although forecasts for GDP were growth of ~0.5% which supports the idea that GDP is not readily predictable. It’s worth noting that the ONS will revise this figure at monthly intervals until they get all the data in – the current estimate is based on 40% of the data being available. Given this abysmal ability to predict GDP I suspect that there is little governments can do to influence the growth in GDP. It would be interesting to estimate the influence government policy has relative to prevailing global economic conditions, and what timelags there might be between policy changes and growth. I think these calculations are illustrative rather than definitive, and what I’d really like is for someone to point to some better calculations!